I’m a big believer that you don’t need to spend an hour exercising. 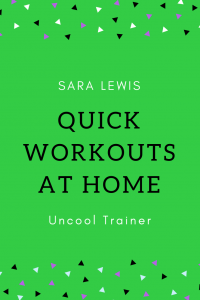 Quick workouts at home are both convenient and effective. The key is how the workout is structured. The triple set links together three exercises to work similar muscles. You fatigue quicker and spend less time exercising. It’s like doing a micro-circuit. There is no rest in between exercises. The first exercise in each triple set is what I call a “big bang” exercise. It works lots of muscles all at once. The next two exercises work the accessory/assisting muscles. Make sure to include a warm up before beginning. The mobility matrix is great to loosen you up. Plus 10 incline pushups and 12 bodyweight squats to warm up your muscles. Do 3-4 sets of each triple set and 12 reps of each exercise. Skater – works your stabilizer muscles in your outer and inner thighs. Plus gets your heart rate up! When you put all three of the these triple set blocks together, you’ll get a complete total body workout! And it will take you 30 minutes or less. For more quick workouts at home, check out Total Body Workout with Weights and Bodyweight Exercises for women.